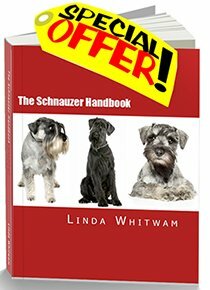 The Miniature Schnauzer is a dog with universal appeal. Just walk down the main street of any town in the United States and you'll probably see at least one trotting jauntily along with a proud owner in tow at the end of the leash. The Miniature – or Mini Schnauzer as it’s often called – is now the 11th most popular dog breed in America and number 7 in Canada. While the breed has traditionally been less well known in the UK, it is becoming more popular year on year, as news of these little dogs with the big personality spreads. It is currently 13th in the Top 20 Breeds, according to The Kennel Club (UK). The Mini has found its way into the hearts of countless dog lovers all over the world. Stylish good looks combined with a lively, often cheeky personality and devotion to their human companions have made the Miniature Schnauzer a popular choice. Many owners have more than one, as Minis enjoy companionship and often do well with other Minis. These dogs are sociable creatures and don't appreciate being left alone in the house for long periods. They are very adaptable dogs, suitable for families, single people and the elderly. They are happy provided they are involved in everything going on. Left alone all day, they can become sad or depressed. New colors of Miniatures are becoming increasingly popular in the USA, particularly white Schnauzers, despite the fact that they are not recognised by the AKC. Parti Schnauzers, which are two or more colors including white, are also gaining in popularity, as are teacup and toy schnauzers, which are smaller versions of the Mini. If you do decide to go for a non-registered Miniature puppy, we strongly recommend that you seek out a good, responsible breeder to prevent heartache further down the line with health or temperament problems caused by poor breeding. This makes Schnauzers popular with dog lovers suffering from pet allergies as well as people who don’t want to spend all their free time vacuuming the carpets and furniture! It’s true. Our mini Max sheds almost no hair. When friends visit with their dogs, I find I’m cleaning up dog hairs around the house for months afterwards. The Schnauzer originated in Germany in the 15th century. In those days tradesmen and farmers travelled the countryside with heavily laden carts selling their wares at markets. They needed a versatile dog which could guard the cart as well as keep down the vermin back at home. Thus the first Schnauzer was born. The modern Miniature was recognized as a breed in Germany in 1880. The first ones arrived in the United States in 1924 and the breed was recognized by the American Kennel Club two years later. Read how the breed got its unusual name and its fascinating history. This is a small, robust dog with a smart appearance. Like all Schnauzers it is square in shape with the height at the shoulders being almost the same as length of the body. 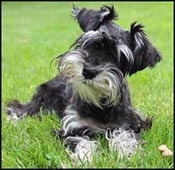 With its bushy eyebrows and trademark moustache and beard, the Miniature Schnauzer is an instantly recognizable breed. There are a variety of colors including white - but many of these are not recognised. While the breed is known for its strong lines and bearded face, the breed standards vary from country to country. In the USA and Canada, the Miniature Schnauzer is classed as a Terrier. In the UK the breed comes under the Utility Group. In North America it is common to have both the ears and tail cropped. For showing, the dog must have a docked tail and can have cropped or natural ears. Since April 2007 it has been illegal to dock any dog’s tail - except for working gundogs – in the UK. Dogs born prior to that with docked tails are accepted in the show ring. It is also illegal to crop the dog’s ears in the UK. In continental Europe, most Schnauzers are left natural with long tails and floppy ears.